When i press the power button I hear the POST beep. After that it seems to try loading the bios but its just an empty window with almost no information. A few seconds later the system reboots automatically in a loop. This is only seen when connected to the gpu. When I connect the monitor to the inernal DVI I don't see anything. Also tried CMOS reset multiple times. try the cmos reset with old gpu in system . I've already tried that multiple times. Does not change anything. when you did replace gpu with new one system was on power or not also inspect motherboard to see if you did not broke the pci-e slot .or board pcb . as its rebooting multiple times what does the short text say? when you reset the bios did you set the drive load order? There is no short text. This it what it looks like shortly before the reboot. I have to mention that only sometimes the system comes that far. Most times i dont see anything before the reboot. 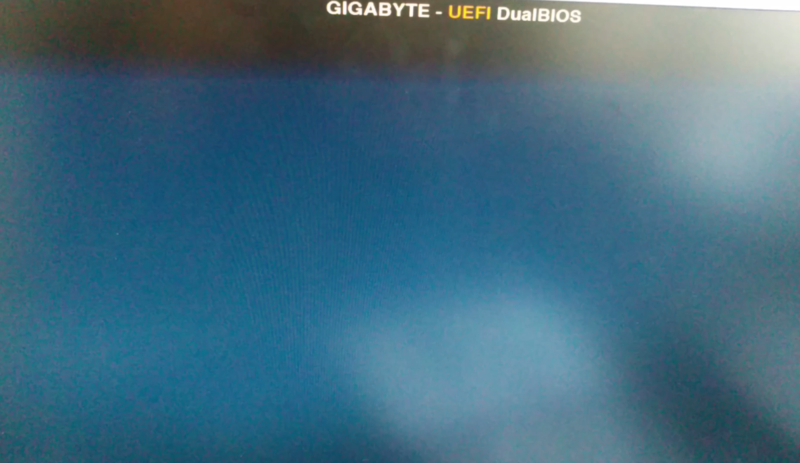 I can't access bios so i cant set the boot order. since it have dual bios check on board manual how ti reset primary bios what is the age of this board might need rma under warranty . how have you been resetting the bios? when you pulled the gpu and replac4ed it did you make sure everything else was properly connected including atx leads and sata power? I did remove the battery for up to 10 min and also the CMOS jumper. Everything should be connected fine. I disconnected the hdd to have better access for the gpu change. Put it back in afterwards. The board is quite old from 2011. It's a Gigabyte H77-D3H. The computer has been barely used in the last 7 years. Max 30 times. list you parts in sytem even old gpu and new one . If you need more details on the RAM HDD and DVD I can look it up. try to boot it with only the os drive on and 1 stick of ram and removegpu from board use onborad to see if you have picture also since board have 2 pci-e slot i would try same thing with gpu in second slot and monitor plug to it . I've already tried all of that. Does not change anything. Tested also with both RAM seperatly. If I accedantly left the power on during change of gpu could that be the reason? sounds like you havent cleared it properly. this time turn the pc off at the wall and short the jumper while theres still residual current in the motherboard. meaning you will have about 10 seconds (give or take depending on howmany led's are on it) to short that jumper. short it for 1 second. turn the pc back on. look like you might have brick the board and made a short on it this board might be out of warranty so you need a new board . see if you can rma it to the seller or manufacturer is my advice now. Today, I could turn it on again. But still the same problem exists. Question My pc reboot booting it opens and write (starting windows) when its about to show windows logo it reboot. Doing same thing over and over again.